Garnishes have changed a lot over the years. From a sprig of parsley on your plate to a handful of alfalfa sprouts on your veggie burger. Move over ketchup and mustard, here come sunflower microgreens. Sprouts have been around for many years. They have had some excellent press because of their tiny stature, ease of growing and of course, their excellent nutrition. I even included broccoli sprouts in my Cancer book as one of the superfoods that people need to eat daily. 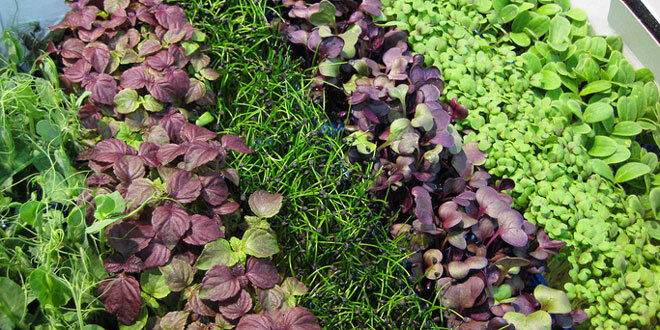 Microgreens have come on the scene more recently. It has only been in the past couple of years that they are in great supply at Farmer’s Markets and even some high-end grocery stores. In her book, “Becoming Raw”, Vesanto Melina (et al) describes living foods. The soaking and sprouting of raw foods “results in an increase in the activity of enzymes, which are generally dormant in raw foods. The enzymes serve to release storage of carbohydrates, fats, and protein.” It is speculated that since microgreens are harvested in the cotyledon growth stage, like sprouts, they too have all the nutrients they need to grow and may be considered a living food. 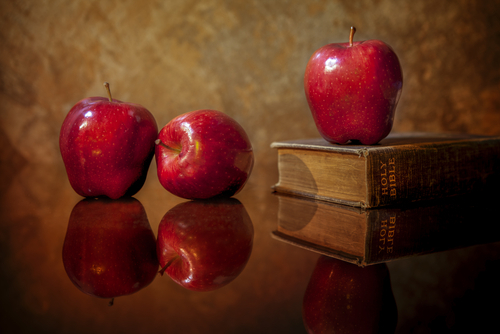 While you may favor one taste over the other, the two are definitely distinct, not only in flavor, but also in how they are grown and even in their nutritional status. Technically, sprouts are newly germinated seeds. They may exhibit their first tiny leaves, known as cotyledons, but (as distinct from microgreens) they are always harvested before they develop true leaves. Grown in dark conditions without soil and fertilizers, the seeds are fed solely by water, air, and the nutrients from the seeds’ embryos. A lot of flavor, vitamins, and minerals that are going to be in the plant are concentrated in the sprouts. Because sprouts are usually eaten raw, they require extremely sanitary growing conditions, including clean seeds and frequent rinsing. The smaller seeds, such as broccoli, alfalfa and radish, contain up to 100 times more of the incredible phytonutrients than their mature counterparts. Essentially, a handful of broccoli sprouts can provide you the same nutritional benefits as a bucketful of mature broccoli. The larger seeds such as the grains (kamut, oats and rye) and legumes (lentils, chickpeas, beans), provide us with the energy (calories) we need to function. In addition to boosting the antioxidant, vitamin, essential fatty acid, and enzyme content, it’s been well documented that the soaking and sprouting process also increases the quality and quantity of fiber and protein. Sprouting is simply the best way to prepare grains, legumes, nuts and seeds. 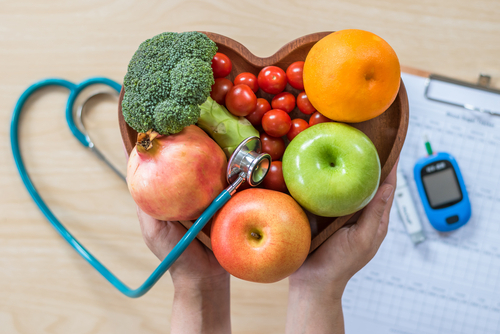 It activates the enzymes, releases anti-nutrients, and improves our digestion and absorption of beneficial nutrients, allowing us to get the most health benefits from our food. The beauty of it all lies in the fact that sprouts can be grown on your kitchen counter every day of the year, and with minimal effort. If sprouts are the infants of the produce world, microgreens are the youngsters. Whereas sprouts can reach their prime in just a few days, microgreens are grown between one and three weeks. According to microgreen research conducted at the University of Maryland, the 1-3 inch delicacies were found to pack anywhere from 3 to 39.4 times the nutritional content of the plant’s mature counterparts. Scientists considered the vitamin and antioxidant levels of 25 varieties of microgreens and compared the results to the full-grown versions. Cilantro showed 3 times more beta-carotene, while red cabbage showed almost 40 times greater vitamin E and 6 times more vitamin C.
Microgreens deliver nutrients that are important for eyes, skin, bones, healthy digestion, reducing inflammation, preventing cardiovascular disease, fighting cancer, and strengthening the immune system. Sunflower greens are one of the most complete foods on earth and the most nutritious of all sprouts. Pea shoots are second in overall nutrition. 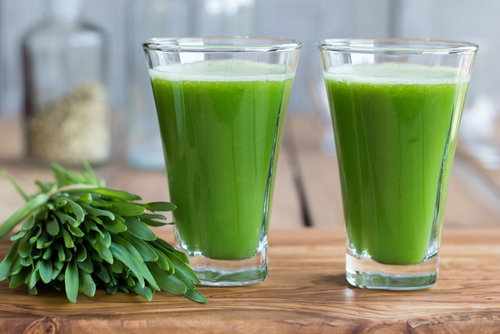 For even greater health benefits, consider juicing them. So, the next time you cut off a piece of cilantro from your plant, you are not only participating in a culinary trend, but you are enjoying a burst of nutrition that will out perform anything you can find in a vitamin pill. Better yet, start some seeds in your kitchen and enjoy maximum nutrition throughout every season in the year. Who is the real winner? You! I need detailed instruction on how to produce the sprouts & microgreens. Where do i find needed info? Here’s a great book called Sprouts The Miracle Food. They are so easy to grow! I love the Fresh Life Sprouter, too, because it has a little sprinkler system that washes the sprouts off for you. I would like to know the details of how to do sprouts. I would like to know the details of how to sprout seeds. Click here for, Sprouts The Miracle Food: The Complete Guide to Sprouting. What would be the best way to consume cashew nuts? Great article–very informative and you have inspired me to do more sprouting and to experiment with growing microgreens. Thank you! Love your article , Paul. As avaid gardener I was exited to learn recently that some plants that we call weeds are actually very high in nutrition. One such “weed” is purslane and the other one chickweed. I now put it in my smoothies too . You have to get used to the taste, but knowing about the benefits makes it worth the try.